How long will the magic last? Has The Librarians TV show been cancelled or renewed for a fifth season on TNT? 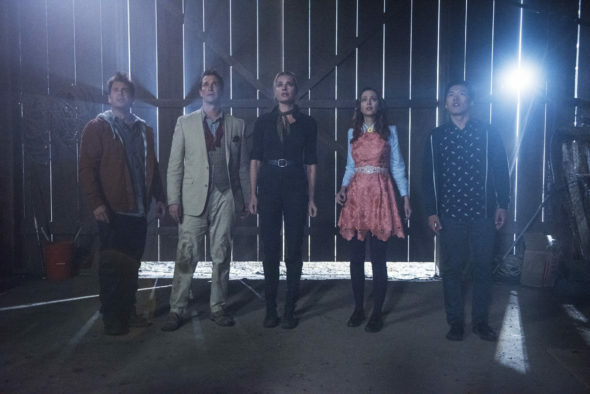 The television vulture is watching all the latest cancellation and renewal news, so this page is the place to track the status of The Librarians, season five. Bookmark it, or subscribe for the latest updates. Remember, the television vulture is watching your shows. Are you? Airing on the TNT cable channel, The Librarians stars Rebecca Romijn, Christian Kane, Lindy Booth, John Harlan Kim, and John Larroquette, with Noah Wyle recurring as veteran librarian, Flynn Carsen. The series centers on the ancient organization dedicated to safeguarding an unknowing world from the secret, magical reality hidden all around. The librarians serve as the protectors of the world’s mystical treasures. The fourth season of The Librarians averaged a 0.29 rating in the 18-49 demographic and 1.45 million viewers. Compared to season three, that’s down by 38% and 20%, respectively. Learn how The Librarians stacks up against other TNT TV shows. On March 8, 2018, The Librarians was cancelled by TNT. Will season five be picked up by another network? Stay tuned for further updates. The fourth season premiered with much lower numbers than last year and the averages are also lower. However, The Librarians is still doing pretty well when compared to the other TNT original series. I’d usually predict another renewal, but TNT has been repositioning itself as an edgier network, and I’m not quite sure The Librarians is still a good fit. I’ll update this page with breaking developments. Subscribe for free alerts about The Librarians cancellation or renewal news. 3/8/2018 update: The Librarians has been cancelled by TNT, but may be shopped elsewhere. Details here. TV show ratings are still important. Follow The Librarians‘ weekly ups and downs. Find more of The Librarians TV series news or other TNT TV show news. What do you think? Do you hope The Librarians TV show will be renewed for season five? How would you feel if TNT cancelled this TV series, instead? Tragic the librarians show being cancelled!! This is one of the series parents, and grandparents can watch together. I love the librarians, don’t cancel. Please. Terrible how great shows are being canceled yet trash reality shows are still on the air. Can’t anything be left on for intellectual viewers? I love this show. I was really disappointed it was cancelled. I felt hopeful it might be picked up by another station. Netflix would be a great choice. I love the show. It was a breath of fresh air. It wasn’t a cookie cutter show’ It was imaginative and witty. I hope some net work will pick it up and not scramble it’s schedule.